No doubt that cricket is a gentlemen’s game. It’s little bit emotional for Indians. Remember the kid Who cried after the India- Afghanistan match got a tie result, he is happy now. Stockily built Mohammad Shahzad knocked a brilliant hundred as spirited Afghanistan pulled off a last over tie against India in the Super Four match in Dubai on Tuesday. Shahzad’s 124 laid the foundation of Afghanistan’s fighting total of 252-8 in 50 overs before bowling out India in 49.5 overs for the same total at Dubai stadium. Needing seven to win off the final Rashid Khan over, Ravindra Jadeja hit a boundary off the second ball before taking a single off the next. Last man Khaleel Ahmed then took a single but Jadeja holed out off the fifth to give Afghanistan a morale-boosting tie with the defending champions. India rested five top players — skipper Rohit Sharma, Shikhar Dhawan, Yuzvendra Chahal, Jasprit Bumrah and Bhuvneshwar Kumar — as they had already qualified for Friday’s final. While cricket fans hailed Afghanistan’s gutsy performance, a young Indian kid present in the stands failed to hold back tears right after the match was over. The fan dressed in an Indian team jersey was seen along with his father who tried to console him. But a phone call from Bhuvneshwar Kumar soon brought a smile on his face. “He is happy now and looking forward to watching the finals…Really kind of @BhuviOfficial to call and cheer him up,” Amarpreet Singh, the father of the kid wrote on Twitter. 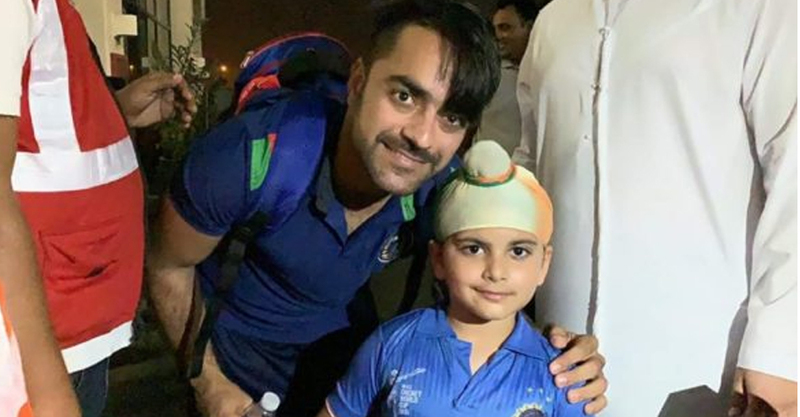 Afghanistan players Rashid Khan and Mohammad Shahzad also clicked pictures with the little one to brighten up his mood.